Redis-completion is now deprecated. The autocomplete functionality, along with a number of other features, have been integrated into a new project walrus. Check out the walrus blog announcement for more details. In this post I'll present how I built a (reasonably) powerful autocomplete engine with Redis and python. For those who are not familiar with Redis, it is a fast, in-memory, single-threaded database that is capable of storing structured data (lists, hashes, sets, sorted sets). I chose Redis for this particular project because its sorted set data type, which is a good fit for autocomplete. The engine I'll describe relies heavily on Redis' sorted sets and its set operations, but can easily be translated to a pure-python solution (links at bottom of post). The schema I used stores autocomplete information in a series of sorted sets. Rich data is stored in a separate hash-table. An excellent description of the schema can be found on Pat Shaughnessy's blog, and this post is mostly building on his. Here is how I have implemented it in redis-completion. For simplicity, the title and data are optional parameters, though in practice I have always specified them. Additionally an object type may be specified, which comes into play later when I'll talk about boosting. To reiterate, we're storing the rich data (e.g. the full title and some associated data) in hashes keyed by a unique ID for the given object. Then, we're iterating through all the partial strings for the full title. Each of these partial strings will be used as a key for a sorted set. The sorted set stores the unique ID and a score for the title that will ensure results pulled from the set are in alphabetical order. One interesting part here is scoring the item to ensure lexical ordering. The way I did that was to convert the title from a string to a base-27 number (1 for each letter, 1 for whitespace), which is what "score_key" does. Time complexity: O(NK)+O(Mlog(M)) worst case with N being the smallest input sorted set, K being the number of input sorted sets and M being the number of elements in the resulting sorted set. We will take each phrase, for example "pyt" and "co", and store the intersection of those two sets in a new sorted set. Redis handles all of this automatically. Additionally, we can set an expiry on this new sorted set so that we ensure our search index doesn't grow out of control, but popular searches will be automatically cached. Pretty sweet. filters: act on the mapped data. Data is passed into the filter functions, and if it passes all filter functions, is returned, otherwise it is discarded. boosts: allow certain object ids or object types to have their score "boosted", pushing them towards the front of the results (unfortunately O(n)). Implementing boosting is slightly more involved. We will allow results to be boosted based on either the object_id or the object_type. The way I came up with, given the schema I chose, requires iterating over the entire result set. The general plan, then, is to store the results in a new key and iterate over them. If an object matches either the type or id of a specified boost, multiply the score by that. Then, when we pull results they will be in sorted/boosted order. Aside from a few helper functions for things like generating lists of keys, scoring keys, and encoding the object id/type, that's all there is to it. It is fast and you can save hits to the database server by storing rich data in Redis. I've packaged this code up in a small project called redis-completion. As promised, I've also got code that will work for a pure python implementation. 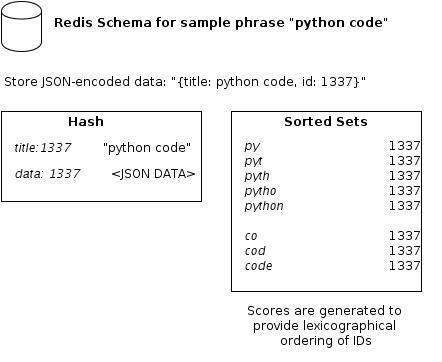 By implementing a sorted set using a skip list, we can replace Redis with an in-memory python data structure. The code for the pure python example can be found in this gist. I hope you've enjoyed reading, please let me know if you have any suggestions for improvmeent, find any bugs, etc!